We've gotten some good feedback on our new review features that will become available in the upcoming JMP Clinical 4.1. If you're new to the conversation, feel free to catch up here, here and here. 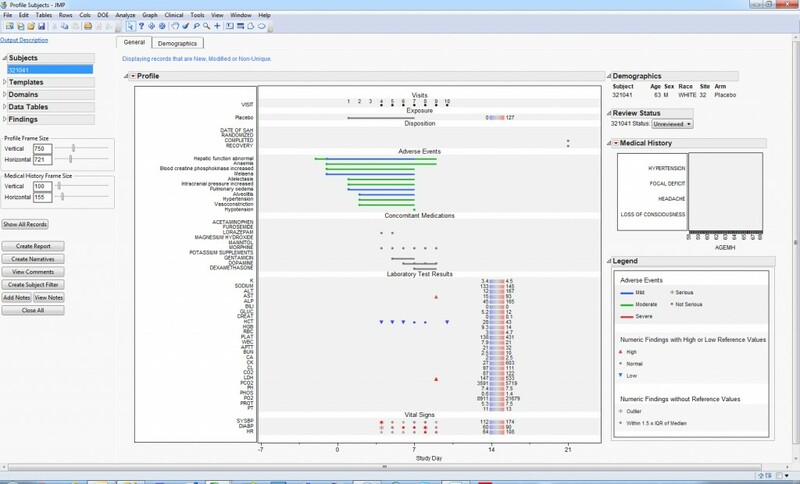 The ability of JMP Clinical to identify new or modified data from snapshot to snapshot, allowing the user to easily subset or filter analyses, is an important feature to accelerate the review of clinical trial data. And creating, saving and reviewing notes at the record-, subject- or analysis-level is important to streamline the management of study details. However, one question we received many times was, “Will these review features impact the patient profiler?" Well, we’re happy to report that the patient profiler has incorporated these new review features. Figure 1 presents data for a subject that spans both sides of a study snapshot. For studies that have updated data at least once, a new button becomes available in the left hand panel: Show New or Modified Records. Pushing this button redraws the profile subsetting data to those records that are new, had a modification to at least one variable or were unable to be compared due to duplications of the record in either the previous or current data snapshot (these records are referred to as non-unique). The new profile is presented in Figure 2. Here, data from Visits 1, 2 and 3 that remained unchanged have been removed from the profiler (based on absence of the symbols). This includes medical history terms, visit attendance, lab and vital sign results and concomitant medications such as acetaminophen. 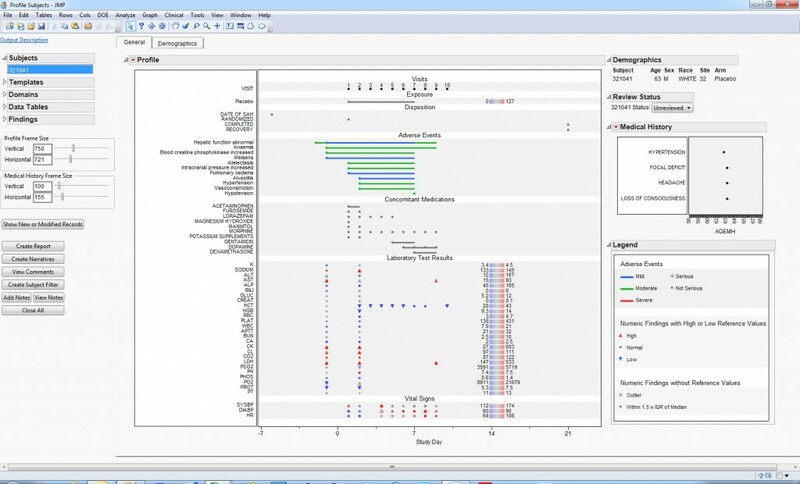 In order to identify specific modifications, the View Notes button shows all notes that were generated by JMP Clinical (Figure 3). Here, most modifications were due to ongoing adverse events or medication use at the time of the snapshot. Non-unique records due to duplicates (not an issue for this subject) would also be identified here. Further, any user notes made on this subject or future system notes would be available for later review in this table. All other records can be considered new for this subject. In Figure 2, notice how the Show New or Modified Records button has changed to Show All Records. If you are reviewing multiple subjects in the profiler, you are free to scroll through the subject list to focus the review on updated data. Pushing Show All Records will return the profiler to the default state of displaying all records.